Microsoft launches Sketch 360 for Windows 10, Lets you sketch and prototype 360 degree VR scenes. Today, Microsoft announce the release of a project that empowers creators to spend less time explaining, editing, and re-doing XR creations, and more time being creative. Sketch 360, a Microsoft Garage project, is a UWP app that enables designers and artists to sketch and prototype 360 degree VR scenes. As designers create and collaborate on 360 degree scenes, sketching provides a quick way to convey the vision of an end-product to a developer or other team member, paving the way to quickly create multiple directions on a design or make tweaks before moving on to the labor-intensive work of 3D modeling. With Sketch 360, a design team can align on the vision for a VR environment and save hours in changes and re-dos. In addition to VR design, Sketch 360 can be used in a variety of sketching scenarios. With guided gridlines and a dual, ink/finished product interface, Sketch 360 can be useful both to designers, architects, and game creators prototyping early versions of a finished product as well as the casual user leveraging the canvas to sketch interior decorating vision or even artists using sketch as their medium. Sketch 360 is another really exciting tool for designers, just like Microsoft Maquette will be for in-device rapid creation. Microsoft Maquette is a mixed reality tool for creating immersive prototypes using a PC VR headset. While Maquette strives to make spatial prototyping fast and easy with a focus on 3D objects, Sketch 360 focuses on the setting around those objects. Designers can use these two, complementary experiences to prototype both the environment of a VR experience and the elements within it. Maquette and Sketch 360 are compatible with mutiple PC VR setups including Windows Mixed Reality, Oculus Rift, and HTC Vive. 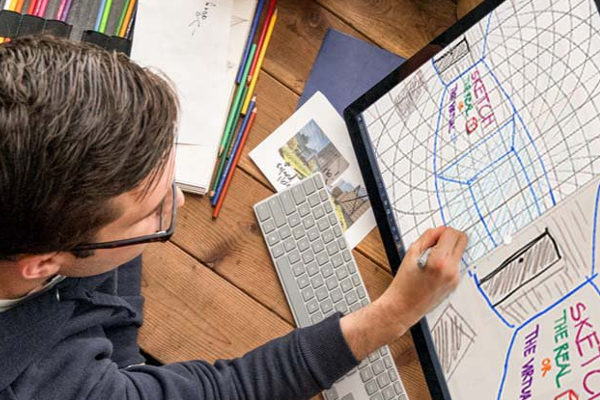 You draw with pens, pencils, and highlighters on a digital canvas using Windows Ink and can see what the end result will look like in 360 while you are drawing it. An equirectangular perspective grid helps you while you draw with a stylus, mouse, or your finger.